On March 29th, VDMX co-creator and Dubspot Instructor David Lublin hosts this free visual performance workshop with special guest Ben Krall on content creation and performance with VDMX5 VJ software. Check out our Visual Performance Program for detailed info and registration dates here. 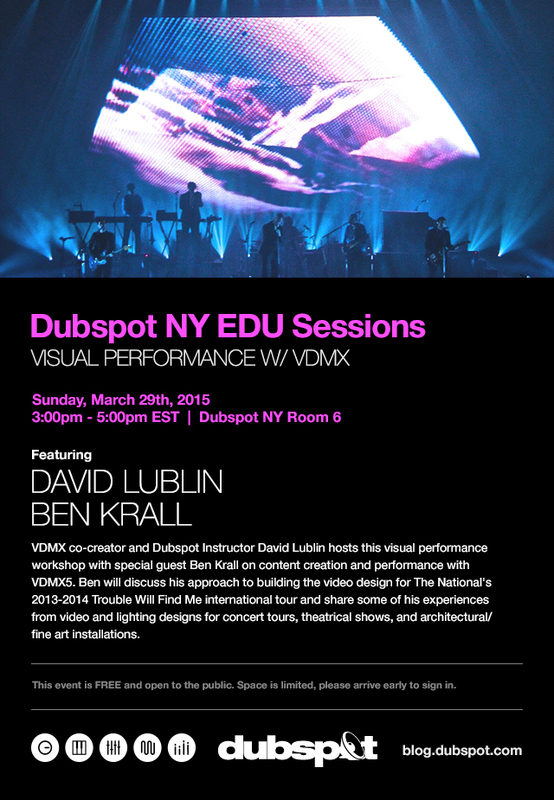 On March 29th, VDMX co-creator and Dubspot Instructor David Lublin hosts this free visual performance workshop with special guest Ben Krall on content creation and performance with VDMX5. Ben will discuss his approach to building the video design for The National’s 2013-2014 Trouble Will Find Me international tour. In addition, he will share some of his experiences from video and lighting designs for concert tours, theatrical shows, and architectural / fine art installations. Together Ben and David will discuss approaches to live design, production planning and fabrication, freelancing, and visual art. Ben Krall has worked all over the world on video and lighting designs for concert tours, theatrical shows, events, and architectural and fine art installations. With a background and education in entertainment lighting design, he brings a strong production and logistical approach to custom lighting, video, art and fabrication projects. Ben will introduce his and production designer Michael Brown’s approach to building the video design for The National’s 2013-2014 Trouble Will Find Me international tour. Emphasis will be on the use of VDMX5 for video playback and content creation. Other topics to include prepare for lighting and show control environments for live shows, overall approaches to live design, production planning and fabrication, freelancing, visual art.